When I graduated from film school I bought a camera and started experimenting. I had to answer that question. Is it true that poetry and cinema are so different and cannot be brought together? I made a few videos. I didn’t even know that the genre exists and has a name. I discovered not only that poetry and film can and should work together, I discovered the possibilities that this hybrid creature offers to those who love poetry and make films. 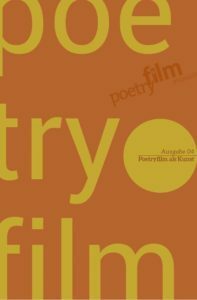 It took me a while to understand and define what poetry film is, but the important experience for me was to discover a new, thrilling and fascinating space and language which developed inside me. I found a different way to make films. When I work on a poetry film I usually do not write a script. I often do not know what I am going to shoot, or how I will edit the footage. When I find myself stuck, I read the poem again and again trying to see the images that it brings into my mind, feel the rhythm it dictates in the editing room, or hear the music or the soundtrack it produces. The whole process is intuitive; I almost cannot explain to another person what I am doing while I am working on it (and sometimes not even when the film is done). When I first heard about the genre, and learned about the festivals dedicated to it, most importantly the ZEBRA in Berlin, it was like meeting old friends that I did not know I had. To watch so many different styles and attitudes, so many directors who make films as poems, was inspiring, and it encouraged me to make some more. My cinematic language was developed, and I became more daring in the interpretation that I gave to the poems: trying to expand and even contradict the theme or the metaphors of the poem. I don’t know if my film school professor saw any of my works or was exposed to this genre, but one thing is certain: I got my answer. Avi Dabach, born in 1972, Jerusalem, is Director & Video Artist. Graduate with distinction of the Sam Spiegel Film School, Jerusalem. Produced and directed over 30 short films and videos, among them 12 poetry films. Produced and directed the documentary »The Last Zionist«, and working on a full length film, supported by the Israel film fund.